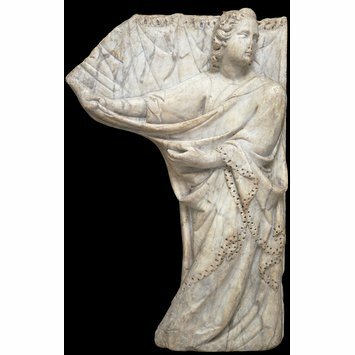 This marble statuette, Two Angles Drawing Curtains, is made by Tino Di Camaino in ca. 1320. 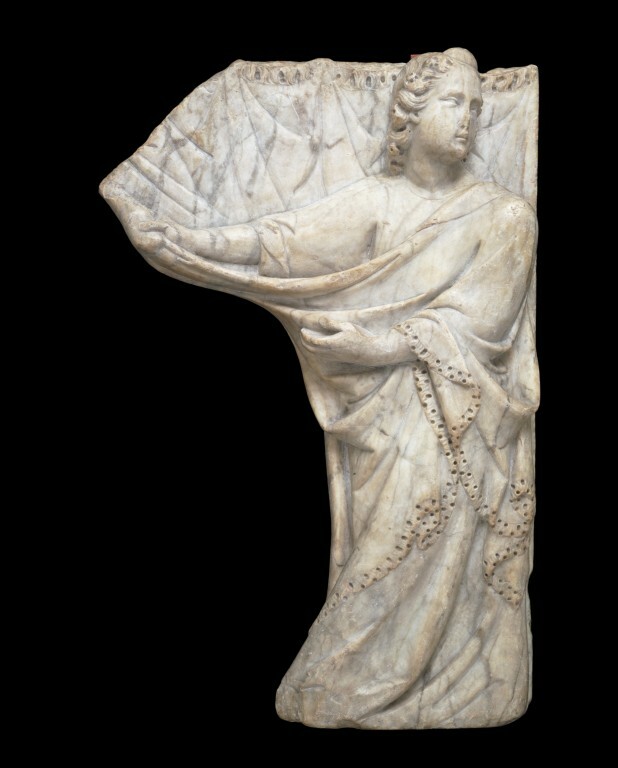 This is one of two angels in the V&A collection which once formed part of a tomb monument. They would have stood at the sides as though pulling back curtains to reveal the effigy. The sculptor, Tino di Camaino, collaborated with Giovanni Pisano as a young man and then went on to produce important tombs in central Italy and Naples. Tino di Camaino (ca. 1280 - ca. 1337) was an Italian sculptor, working in Siena, Pisa, Florence and Naples for some of the most powerful Guelph ang Ghibelline patrons of the day. He was also the most important and inventive sculptor of funerary monuments in Tuscany. 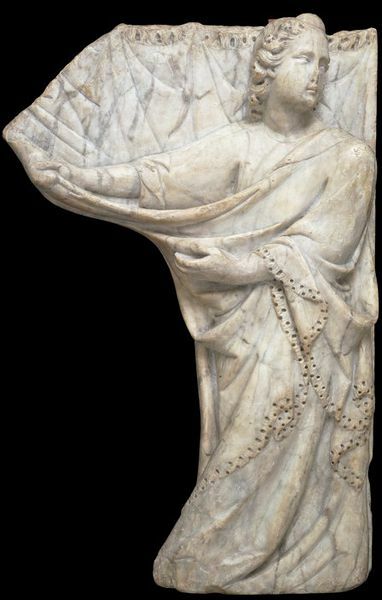 This and a companion figure (7567-1861) originally formed part of a tomb monument similar in type to the slightly earlier tomb of Cardinal de Braye (d. 1282) by Arnolfo di Cambio in S. Domenico, Orvieto. It was once thought that they had been attached to the monument of Antonio d'Orso, Bishop of Florence (d. 1321) in the Florence Cathedral; however, this now seems unlikely and it is probable that they belonged to another, now dismantled tomb of about the same date. The relief is a companion piece for 7567-1861. Purchased from the Gigli-Campana Collection. Baldelli, Francesca. Tino di Camaino (Morbio Inferiore, 2007), cat. no. 19.